Parnell Memorial Library is fortunate to have received through a bequest from Dr. L. C. "Foots" Parnell, Jr. a collection of books, periodicals, maps and other materials that reflect Dr. Parnell's eclectic interests and his particular fascination with American history, especially the Civil War, Southern history, and Alabama history. 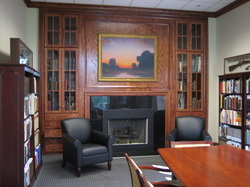 Since the library opened in February of 2007, the Parnell Collection has been housed in the paneled Parnell Room, where it is a part of the library's reference collection and is available for on-site use by everyone from researchers to casual history buffs to the general reader. This special collection had never been officially catalogued, since it had been in the den of Dr. and Mrs. Parnell's home for many years. It needed to be done so that visitors to the Parnell Room as well as visitors to the online catalogue of Shelby County libraries could know what the collection contains and how to locate specific items within the collection. The project of cataloguing the collection was completed in late 2012. It was sponsored by the Parnell Memorial Library Foundation Board under the direction of board member and former board president Elizabeth Rodgers. The project was coordinated by Carey Heatherly, Assistant Professor and Archivist at Carmichael Library at the University of Montevallo. Assisting Professor Heatherly were UM student interns, often history majors, who earned academic credit for their participation in the project. Some of them have had a special interest in the Civil War, and several are considering a library career. This project is an example of the cooperative, mutually beneficial relationship that exists between the University of Montevallo and Parnell Memorial LIbrary, which is owned by the City of Montevallo and is part of the Harrison Regional Library System in Shelby County, Alabama. The Foundation is very grateful to Professor Heatherly for undertaking this major project . He has handled it with professionalism, enthusiasm, and tenacity of purpose . The work of IT librarian Mary Hedrick at Harrison Regional has also been crucial to the success of the project; the Foundation very much appreciates her on-going support.